Camping stories 6 took place at Paget Island. I went on a weekend training camp for leaders of a boys and girls club called Pathfinders. The camp was on an island and the boat was leaving at 6:00 p.m., almost an hour after sunset. 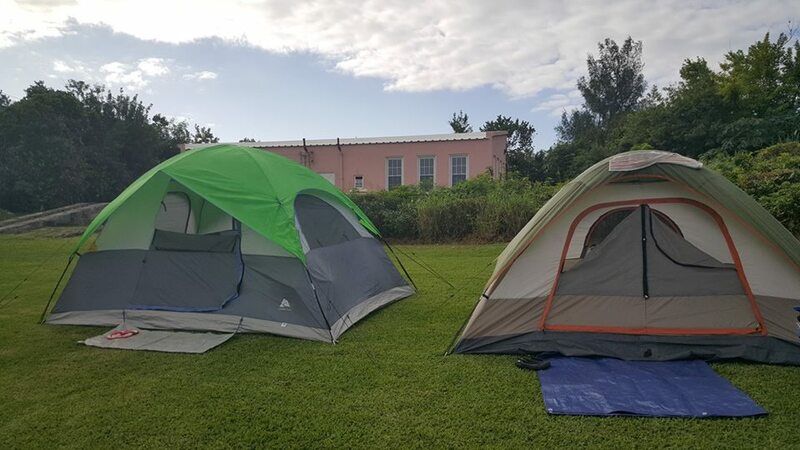 My friend Pam, from a different club, and I decided we wanted to sleep in tents and not the dormitories. We wanted to go earlier than the set time so we could get our tents up before the sun set. So after talking to the Director about it he decided to hire another boat for 3:30 p.m., which worked out great for us and also the camp cooks. My tent is the gray one with the bright green fly. I decided to take my small cheap tent, because it is light weight and more suitable for one. I wanted to be prepared for rain and I knew the tent I was taking would surely leak if it rained, but I didn’t want the hassle of setting up a tarp over it. So I found some left over Texsport waterproofing and seam sealer for tents and prayed it would work. I sprayed the fly of my tent and parts of Pam’s tent but I forgot to spray the body of my tent. Well of course it did rain, but the fly did not leak. I was very grateful for that spray. However I didn't spray the tent itself and the fly did not cover the whole tent. Water started seeping through the sides of the tent where the windows are that I hadn’t sprayed, but that was manageable. I enjoy the sound of rain on a tent, when the tent of course is not leaking. I had taken the time to guy out the tent and not just stake out the 4 corners. That was a great decision, because the wind came up during the night but the tent didn’t move. It stood up to the wind gusts very well. I was proud of my cheap tent. With approximately 36 leaders at the camp, only Pam and I slept in tents. However I do believe a few were jealous and wished they had also thought to bring tents.